Bellevue Investors Co started out as such a small company 50 years ago that for the first five years of its existence, the 3 partners, Sam Helberg, Charles Moulopoulos and George Kuehnl Jr dabbled in real estate investing part-time while continuing to work as a barber, dentist and builder, respectively. In fact. the business began in Mr. Helberg’s barbershop one day in 1959, about nine years after he immigrated to the US from Europe, where he and his wife Tonia were survivors of the Holocaust. Mr. Helberg had saved $3,000 while barbering and had several residential investment properties. Dr. Moulopoulos, a customer of the barbershop, who knew of Mr. Helberg’s real estate investments and wanted to build a dental building and asked Mr. Helberg for his help in finding a site. At that time a 3rd party, Mr. Kuehnl, was brought in to help locate a site and handle the construction. The site they chose was 3 1/2 acres of land on Bellevue Road (which became the source of the company name) and another on Collingwood near Scott High School. The dental office did not materialize on Bellevue Road, instead the land was sold as part of the freeway right -of-way. 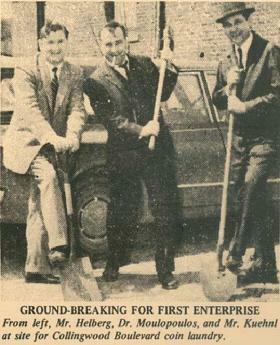 The Collingwood site did become the first construction project for the trio when they build a coin laundry. Their first office was in that laundry, and consisted of one desk, and each partner took turns sitting at the firms desk. From the humble beginnings, their real estate ventures together escalated over the next 20 years. The trio developed over 500,000 square feet of office, retail, apartment and residential projects in NW Ohio including areas such as Toledo, Sylvania, Northwood, Bowling Green. They also had projects in SE Michigan areas including Bedford Township and Ann Arbor. (Today that total is over 1 million square feet). They were responsible for a number of firsts in the area including Frank’s Nurserys, Aldi Foods, and Domino’s Pizza. In the 1960’s after only spending a day with Mr. Helberg and shooting pool with him at his home, a young man named Tom Monaghan signed one of his first leases for a small pizzeria in Stadium Plaza in Bowling Green called Domino’s Pizza. The trio had vision for seeing an area of growth, long before the technology was available to do traffic counts, and detailed demographics. They purchased and developed about 20 acres in the Monroe St-Talmadge Rd corridor prior to the existence of the areas largest regional mall, now known as Westfield’s Franklin Park. They always thought their “luck” in the business was due to a combination of hard work and patience. In fact, for their first years all cash flow went right back into the business for growth, which is why they all continued their regular jobs. Mr. Helberg said they always liked dealing with local lenders to establish a relationship, it was not about a bargain rate, but knowing who you were dealing with. Humility and faith were other ingredients in working together for all those years. The men did not like to be referred to by anyone as “Mr”, they preferred Sam or “Sam the poor barber” as Mr Helberg was warmly known around town until his passing in 2003. Dr Moulopoulos to this day is known as Charlie or Doc. Mr Kuehnl, who passed away in late 2008 was simply George. Three men with very different backgrounds, hobbies, religions, learned to work well together by separating their business and personal lives. They prided themselves in working with hundreds of new start up tenants over the years, always trying to remember that everyone starts somewhere and taking great pride when the ones they “cut a break to” at the start turn out to be the tenants they had for many years. They had a regular practice, they is still being done today, of sending flowers to new tenants to welcome them to the building and wish them success. Toledo attorney Tom Helberg is principal of Bellevue Investors Company, a real estate development company co-founded by his father. While he clearly enjoys what he does, the Sylvania native didn‘t initially plan on a career in either law or real estate. Both of Helberg’s parents were Holocaust survivors who immigrated to America after World War II. His father, Sam, was a barber by trade. In 1959 Sam and two of his customers, a dentist and a construction professional, pooled their resources to become partners and form Bellevue Investors. 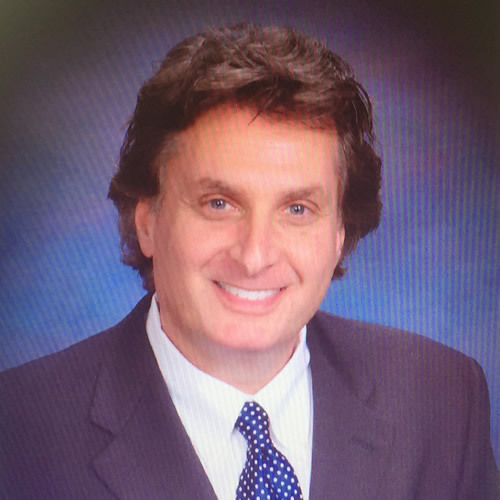 When Tom Helberg graduated from Northview High School in 1977, he attended college at the University of Southern California (USC), looking at the possibility of a career in the film industry. While attending USC he met his wife and moved back to Ohio in order to attend law school. The plan was to return to California after obtaining his law degree, but 27 years later he remains a Toledoan. According to Helberg, the local real estate market was strong when he graduated from law school, and he chose that field over the film industry. “It was my choice; I think you kind of find your personality and it was a matter of needing something structured to go to every day,” he stated. Near the time Helberg graduated law school and decided to get into real estate, one of his father’s original partners was in the process of leaving the business. 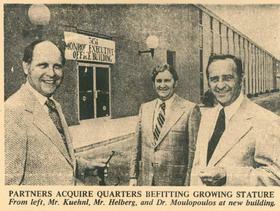 Helberg joined the firm with his father and the other partner, George Kuehnl. The year was 1984. “We each kind of had our niche,” Helberg explained. “George oversaw anything related to construction, my father was the numbers man, and I handled the legal end and management. My father was pretty street savvy; until he passed all the numbers were written down in longhand.” Helberg added that, by the time he joined the company, the others were inching towards retirement, spending more and more time away from the business, which gave him a lot of responsibility early on. He stated, “To my good fortune, although it didn’t appear that way at the time, they were spending more time each year in Florida, since they both had places down there. That forced me to get outside of what I did and learn some of what they did. But there was no better way to learn. I’m still learning. You don‘t have to be an expert at everything, and there are people you can tap into.” He explained that, while all three of them had different personalities, they were all able to get along, something that was more important in the age before emails and text messaging. “You would sit down a lot more face to face.” Helberg spent about 20 years working with his father and Kuehnl. “The first ten years I didn’t say a lot. The second ten years, with their support, I started to do things independent of them,” he explained. Helberg’s father passed away in 2003, and Kuehnl no longer worked full time at the time of his death in November 2008. “They both loved what he did, and would come in until the very end.” The thing about this business is that things can still happen even if you’re not sitting at your desk. So they were able to be semi-plus retired yet they still kept their hands on the big picture,” Helberg stated. Although Helberg explained that there isn’t an exact moment where he took over the company, his partners simply kept spending more and more time away from the office, and his role eventually evolved into being the principal of the company. Helberg still partners with several other people on individual projects. “I will partner with other folks that bring something to the table,” he stated. “For a lot of people it allows them to be involved in this industry without having to be involved in the day to day. They get full financial reports every month.”According to Helberg, one of the things he has learned is how to evaluate situations in a certain way and not be deterred from that formula. Though he added that experience and instinct play an important role in his decision-making. He pointed out that his father didn’t have much formal education but was still a shrewd businessman, with a good instinct. “After a while, a lot of it is instinct. I see and look at stuff (on the Internet) and you can get pretty close to getting a good feel, but I would never buy anything until I can walk on it and touch it,” he stated. 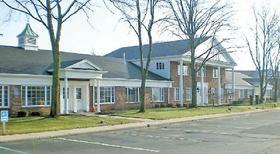 One of his recent projects involved an office building in the Country Square complex on Monroe Street in Sylvania. The building was owned by a dentist and made news a couple of years ago when it was seriously damaged by fire. The owner of the building told Helberg that he wanted to focus on his dental practice, but dealing with the building was consuming much of his time. So Bellevue Investors stepped in and rebuilt it. Today the entire building is fully occupied by tenants.